Oxford Greens: Victory Memorial Park. "The village of Oxford contains two stores, a hotel, shops and Congregational and Episcopal churches. These stand on the sides of the village green, consisting of several acres, around which are clusterd the principal residences of the village. The upper part of the green was long known as the "meeting house acre," and was set aside for that purpose by John Chatfield; the lower end was added from the proprietor's land, and was secured by Charled Bunnell, a public spirited citizen, who lived on the hill south of the village. The honor of clearing the land and first imnproving it for public purpose is given by Judge Wilcoxson yo Colonel John Davis, Leutenant Samuel A. Buckingham and Ensign Ebeneezer Fairchild. On the lower part military trainings were held, and it is said that these occasions attracted large crowds to Oxford. When the village was first laid out, the main road went on what is now the back of the greens, but when the Oxford Turnpike was built in 1795 the road was moved to the present side of the greens. The Oxford House was built in 1795 and served as an inn. THE PUBLIC GREEN: This is made up of what is called the "meeting-house acre land' given by a Mr. Chatfield for a meeting-house and of land thrown out by proprietors along down on the easter side until it ends upon the turnpike road. This constitutes what is called Upper Green. It was agreed at that time, that anything of rubbish or whatever could encumber the ground, if thrown out and left thereon, should after thirty days become a forfieture to the owner. The Lower Green is proprietors' land and laid by a committee for a public common and a military parade ground. The honor of making the suggestion for thus laying out the lower end of the green belongs to Esq. Charles Bunnell, an unselfish, public spirited worthy and respected citizen; and held a prominent place in the confidence of the people. His residence was that of the late Harry Sutton. He died in March 1838, aged 80 years. The land thus given being a thickly grown bramble the people turned out under the lead of a committee, three military officers of the day and time, Capt. John Davis (afterwards colonel)*, Lieut. Samuel A. Buckingham and Ensign Ebenezer Fairchild. They cleared the land of rubbish and brought it to its present desireable condisiton by a large expense of time and money. The whole public common, both upper and lower, were laid out and improved under the leading of the same committee. " the east was for many years the home ofthe village physician. 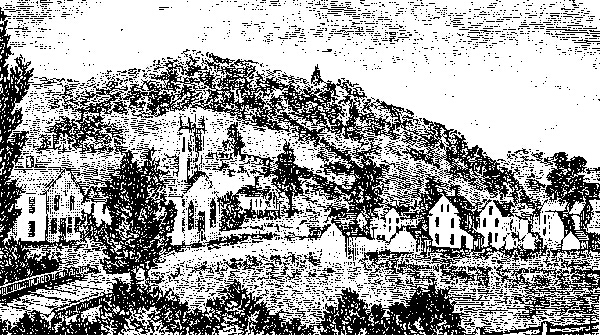 On the left of the Congregational church is the fine old Colonial residence of the late S. P. Sanford. On the west of the street was for a century the village inn, the place of rest and refreshment for man and beast on the main road from the ports of New Haven and Derby tot he towns far to thenorthwest. On the west side of the green also were the houses of the village postmaster and the Judge of Probate, while a little to the rear flowed quietly along a clear stream which at times filled its banks with a swollen and more turbulent current which then merits is name of Little River.